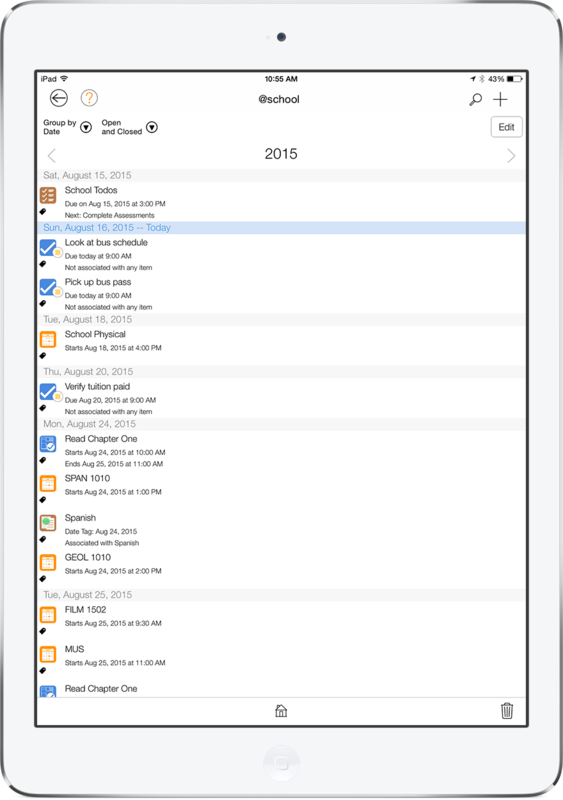 With the new school year quickly approaching, students and teachers are gearing up with the best tools and apps to manage and organize their busy education schedules. Lucky for them, LifeTopix is available to manage school and life in one place. 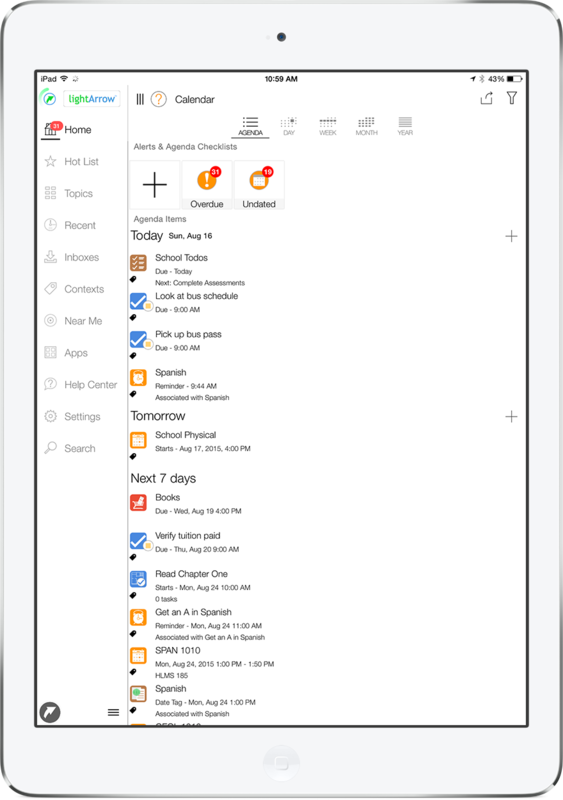 This amazing app unifies contacts, calendars, projects, documents and other related information in one app, which allows students to focus on what matters – their education. LifeTopix is based on 12 topics, which include: Tasks + Projects, Shopping + Gifts, Events + Appointments, Travel + Places, People + Services, Health + Goals, Finances, Home + Assets, Education, Notes + Files, Lists, Media and Bookmarks + Lockers. How Do Successful Students Use LifeTopix? 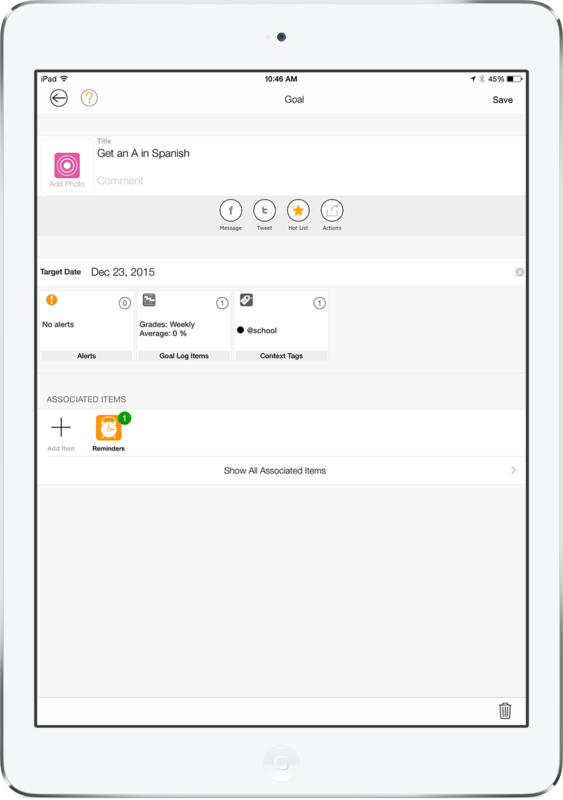 Keep reading to learn how successful and organized students use LifeTopix to get ahead. When starting a new school year, there’s usually a ton of to-dos – forms, shopping, making calls and arranging finances are just to name a few. 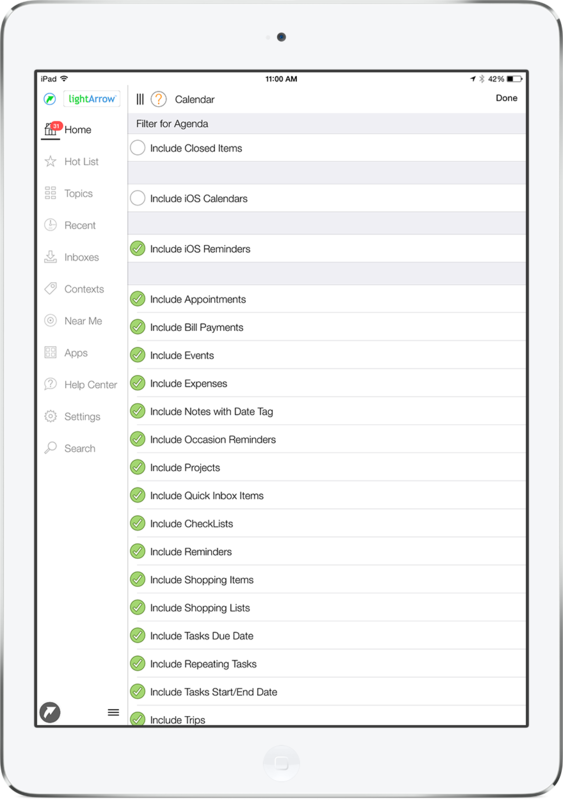 With LifeTopix’s built-in checklists (shown below), keeping track of these details is stress-free. And what’s great about LifeTopix’s checklists is students can quickly email them to parents to let them know their status on getting things done. Keeping track of classes is always a hassle, especially when you’re a new freshman at a university or high school. Getting a handle on schedules is imperative for success. 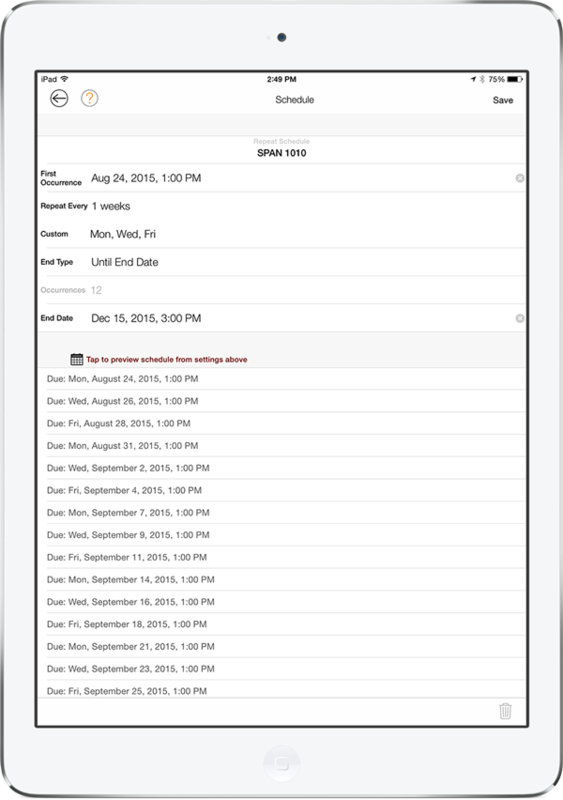 Luckily, with LifeTopix’s ability to create custom schedules, as shown below, it’s easy to create class schedules. For example, repeating classes that start on different days of the week, such as Monday, Wednesday and Friday can easily be recorded — which is not possible in many calendar apps. Students and parents are turning to smartphone apps to help them manage their back-to-school shopping. Whether they’re shopping online or at the physical store, apps can help students, teachers and parents make a list of things you need to buy. 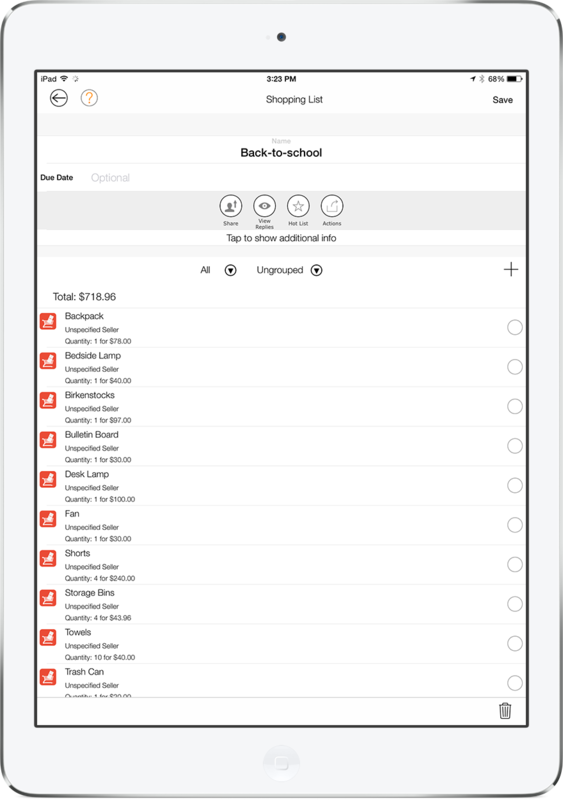 With LifeTopix, students can create lists by either creating a shopping list in the Shopping topic, as shown below, or they can create a LifeTopix checklist. With a LifeTopix shopping list, it’s easy to add prices and deadlines to assist with budgeting. LifeTopix includes built-in features for students or anyone else who is furthering their education. One of these useful features is “Subjects” in the Education topic of LifeTopix. 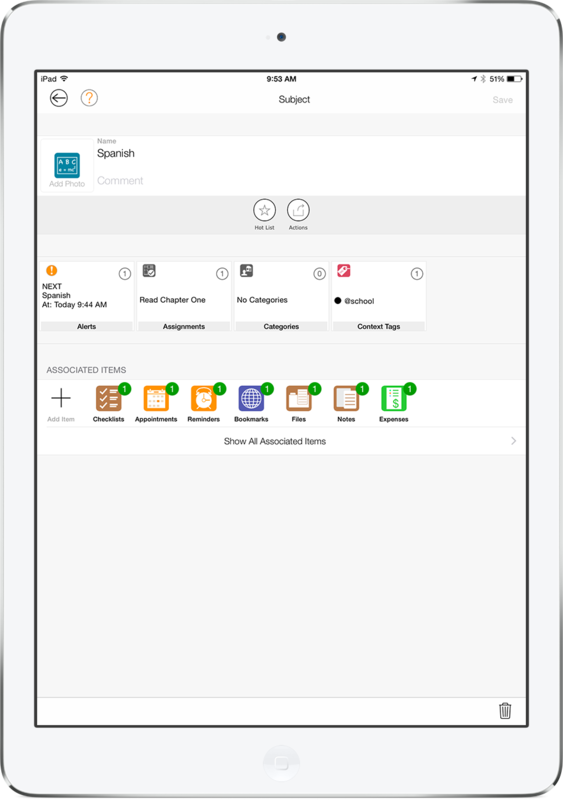 With LifeTopix’s Subjects, students can keep track of Assignments and attach supporting information, such as tasks, appointments, reminders, notes, checklists, files, bookmarks, expenses, services, audio, photos, videos and drawings. 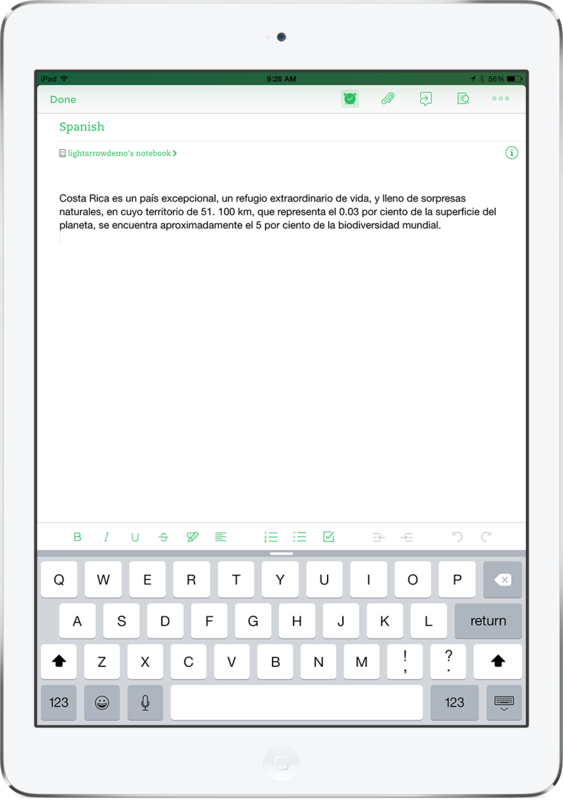 Essentially, students can add bookmarks to Spanish to English translation sites and their class’s webpage; add recorded audio of class lectures (if allowed); add class notes; include any class expenses; etc. All of this is neatly organized into one place, as shown below. 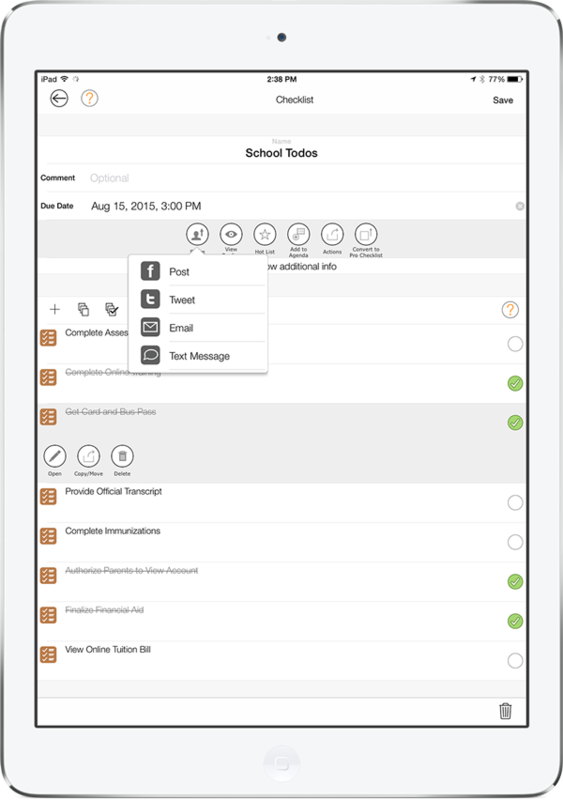 LifeTopix includes built-in note taking and students can sync class notes with Evernote. However students choose to keep track of notes, it’s simple with LifeTopix. 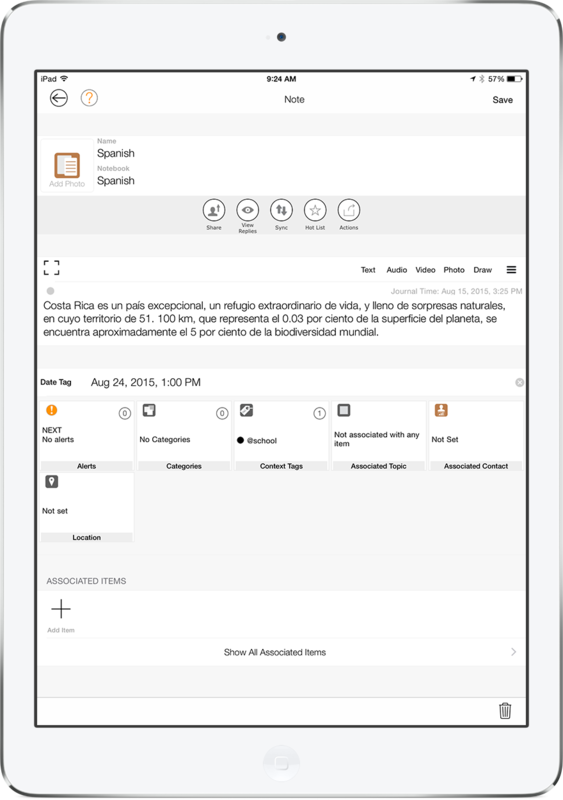 Moreover, students can easily organize and locate notes by using categories, notebooks, context tags, and date tags in LifeTopix. Additionally, they can hand write, record audio and take video within LifeTopix notes, which makes the note-taking process even easier. The screenshot below shows an example of a LifeTopix note before and after it’s synced with Evernote. Successful students and business people alike know that setting goals gives them motivation. If you want to make the most of your life, setting goals is essential for achieving your dreams. LifeTopix includes a topic for focusing on health and goals, which is perfect for students. Everyone understands it’s important to make good grades. The goal recorded in the LifeTopix app below is set up to focus on getting an A in Spanish. With this goal, students can log their grades to get an idea of where they are daily, weekly, monthly or for the entire semester. 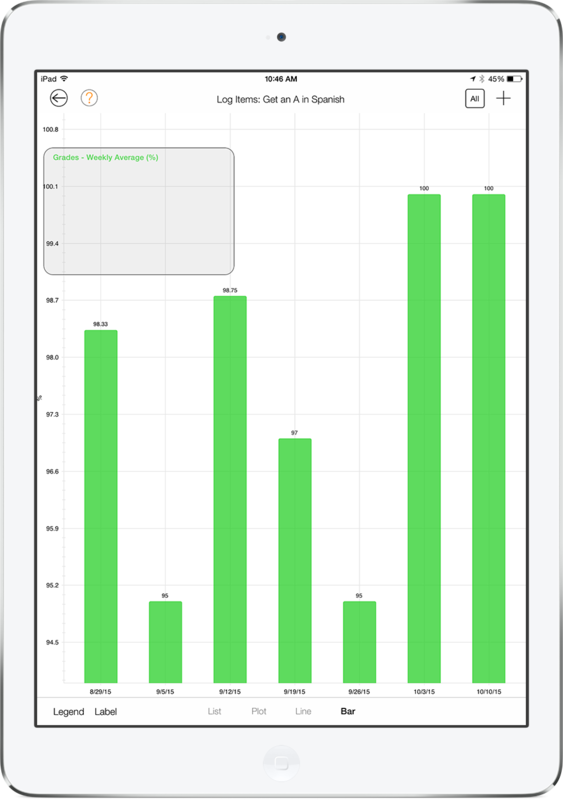 And what’s great is they can view the grades in a graphical format (shown below). This is a great motivator to keep students on track in their studies. Every type of item that’s added in LifeTopix is picked up by the daily agenda and calendar views; however, students can filter these items as they wish as shown below. 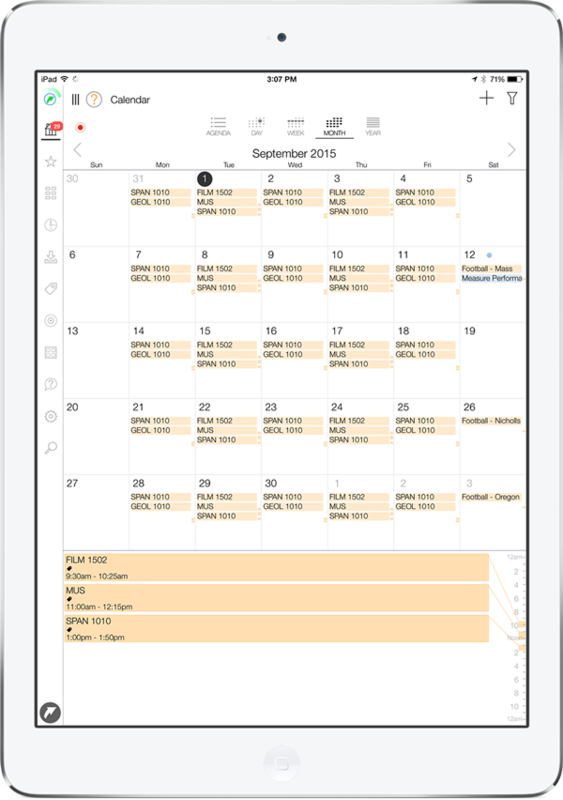 Keep in mind that the LifeTopix calendar works with the calendars that the iOS device supports, so students can choose which of these items sync back and forth from their favorite calendars (Google, Yahoo, etc.). The flexibility is fantastic. Everyone has lots of things to do in work, school and life – and sometimes it’s helpful to see the commitments that are associated with each part of life. This is one of the reasons that LifeTopix includes context tags. For example, most of the items mentioned in this article were tagged with the context tag @school. This way, students can view anything related to this tag in one single list, as shown below. They might also use tags such as @work, @social, etc. to organize or divide those items into one view. Bear in mind that these are just of the few of the many ways that students use LifeTopix to help them achieve success in school. Above and beyond the features listed here, other features include managing finances, logging fitness items, keeping track of social events, managing documents, tracking passwords, recording travel and more. Are you ready to get organized? Find LifeTopix at the Apple App Store by clicking the link below. © Copyright 2009-2016 LightArrow Inc. Austin, Texas. All rights reserved.